Less than a week ago, Lexington senior Cade Stover witnessed his high school football career come to an end. After beginning their season at 1-4, Stover's Minutemen rolled off five straight wins to end the regular season, and snuck into the Division III, Region 10 playoffs ... where they got their sixth straight victory in a 31-21 final over Tiffin. But that magical run came to an end last Friday in a 56-12 loss to Sandusky. Still, Stover ended the year with 175 tackles, four interceptions and nine pass break-ups on defense, as well as 1,497 rushing yards and 18 touchdowns on the other side of the ball. Those numbers symbolize the final pieces to a career that includes 313 tackles, eight interceptions, 24 pass break-ups, 3,613 all-purpose yards and 37 touchdowns. Thankfully for Ohio State, Stover committed to be a Buckeye on April 29. 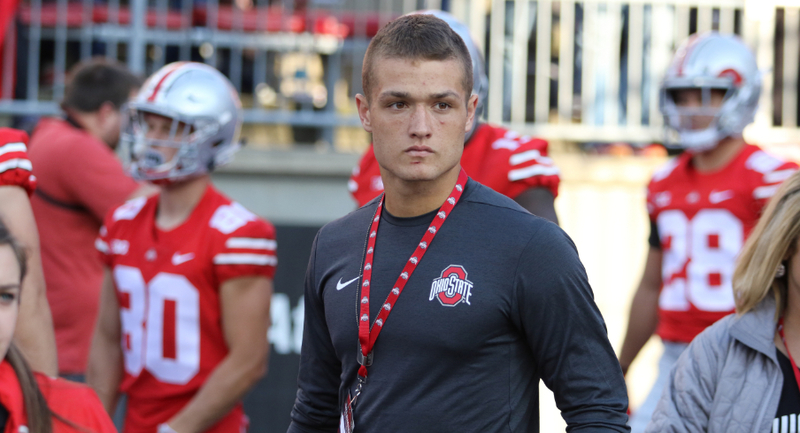 I caught up with the Mansfield News Journal's Jake Furr — who extensively covered Stover's senior year — and asked about the future Ohio State linebacker's demeanor, his role as a teammate, his best qualities on and off the field, and much more. As a beat writer, where does Cade Stover stand in terms of the best players you’ve ever covered and why? JF: I haven’t been doing this long; I’m in my sixth year covering high school sports as a writer, but I have always gone to games with my dad since I was a kid. He is by far, the best player I have ever seen. His abilities are so far advanced for a high school football player. I’ve talked to several reporters from around my area who have upwards of 20 years of experience and they say he is the best defensive player they have ever seen. I have never seen a player make such an impact on both sides of the football. When you think the opposing team has the potential for a big play, Cade comes out of nowhere and make a play very few players in high school football history could make. He truly is that good. Off the field, what’s Cade like? Classroom, family life ... all of that. JF: Cade is deeply invested in his family’s farm and is one of those kids who sacrifices his time when he could be doing anything he wants in order to help out his family. Just from talking with his coaches, he is a leader off of the football field as much as he is on it. His best friend is Kyle Johnston, who just won the Division II state cross country individual championship. So as much as successful people want to be around him, he also surrounds himself with successful people and that, in turn, will lead him down a path that will allow him to succeed in anything he wants. What’s your favorite game you saw Cade play in? JF: The first game I ever saw him [a loss at Ontario], he had at least 30 tackles and every hit he made, you could hear it from the press box. But the game that really sicks out is the regional quarterfinal game this year at Tiffin Columbian. He had a pair of interceptions, ran for almost 200 yards and had pretty close to 30 tackles again. The one play that sticks out to me the most was a screen pass by Columbian. Watching the play develop, there was no one within 15 yards of the receiver and he had three linemen out in front. The quarterback lifted the ball up and just as the receiver caught it, Stover had already split the three linemen and took out the receiver's legs for a loss. It was the most incredible individual play I have ever seen. What type of an athlete is he like in other sports? JF: Cade also plays basketball at Lexington and I had the honor of covering the Minutemen last season. They made a run to the state semifinal for the first time since 1991. Stover was a huge reason why as he averaged a double-double during his junior year. As relentless as he is on the football field, he is just as relentless on the basketball court. If a shot goes up and he is not around the rim for the rebound, something is wrong. I think he could be a Division I basketball player as well. This year, he will set the Lexington High School scoring record, passing Jamie Feick who played in the NBA and starred at Michigan State. Stover already has the rebound record. People were surprised to hear he wasn’t going to enroll early at Ohio State, but he really loves basketball and it wouldn’t be his style to leave his teammates hanging on the eve of what could be a huge season. In talking to Cade postgame, what’s his demeanor like? JF: Cade is a very serious kid when talking to him postgame, which is cool because as a reporter, I like talking to those players who take the game serious and approach it like the game they just played really meant something. He always gives his teammates the props they deserve. After the regional quarterfinal game, you could tell how focused he was and how much he treated that game as a business trip. In your opinion, what does Cade bring to the next level overall and why will he excel at Ohio State? JF: The number one reason Cade will excel at OSU is because of his work ethic. The kid is already a physical specimen, but I always hear people say that he will have a wake-up call at OSU. I always just think to myself, 'Wait until he has six months with the OSU strength coach.' His dedication and desire to be great will have him ready to make an impact. I mean, the kid works on his family farm before school and after football practice. It’s like he never sleeps and I think he will take that mentality to OSU. No matter where they put him on defense, he is going to have an incredible impact.